Ian and I ate our carrots at the base of the tower because it was too damn cold to do anything else. A wind was howling over the mountains of Donegal and, to the west, the sea was exploding against the cliffs of the Irish coast. It was a particularly wet Saturday, even by Irish standards, and especially bad for anyone foolish enough to attempt some hill walking. Unfortunately, Ian and I were foolish enough, and so there we were, standing at the base of a ruined tower at the edge of the sea. “How old do you think it is?” I said to Ian. He was Master’s student in Archaeology, so I assumed he would know about this sort of thing. We stood in silence, chewing on our thoughts with the deliberate slowness of grazing cattle. “So it’s pretty goddamn old,” I said. I ate the last of my carrot. I stared at the leftover nubbin, marveling at its insignificance. To the north, a vast wall of rain was rolling over the heather growing in the mountains. 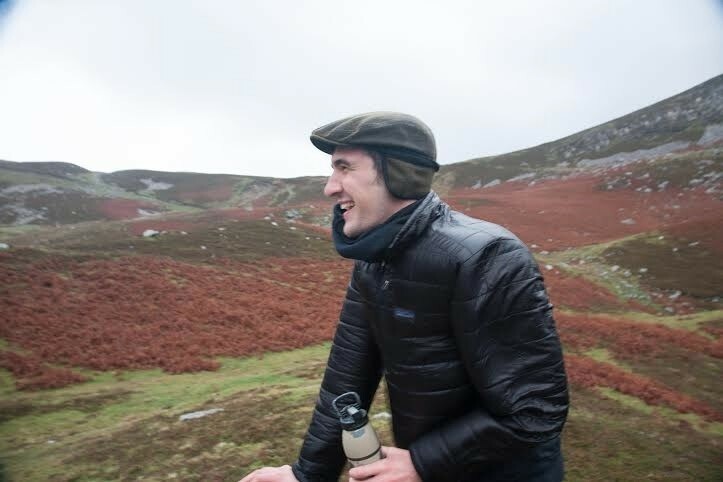 In 2013, I moved to Ireland with two of my closest friends, Ian Ostericher and Natalie Morningstar. Ian and Natalie were enrolled as Master’s students at University College, Dublin, while I was preparing to start a Master’s in Irish Literature at Trinity College, Dublin. For most of my life, I have possessed a relentless restlessness, a fierce and independent impulse of foolishness, and it was this same instinct that drove me thousands of miles away from my home in the Pacific Northwest. I was eager to travel, to prove myself, to write a dissertation of unimaginable brilliance, or something like that. Ian and Natalie and I moved into a small house on the southern outskirts of Dublin. Whenever I wasn’t busy reading for classes, I spent most of my time wandering around the neighborhood, either with Ian and Natalie, or by myself. We lived in a quiet network of narrow streets lined by old stone walls and verdant gardens. To one side of us was the Irish Sea and, to the other, was the mountain known, delightfully, as the Great Sugarloaf. I spent many evenings walking up to the top of Killiney hill, from which point I could see all of Dublin spread out before me, from the agreeable rolling lumps of the Dublin Mountains to Dublin Bay and the outstretched embrace of Howth. I spent a long time at the top of this hill. I stayed until the sun set and the lights shone out over the darkness of the deep. Finally, we reached our cottage on the slope of one of the mountains. Before going to bed, I walked out onto the porch to get some fresh air. The silence that greeted me was unearthly, alien, better suited to the pockmarked surface of the moon. In the morning, Natalie left for her Irish lessons and Ian and I set off for a walk through the surrounding countryside. The weather, which had originally been agreeable, quickly descended into a rainy, sloshy mess. Still, Ian and I trudged on. Neither of us could explain exactly why we did so; the only plausible explanation was that going back seemed to be in rather bad form. Unwilling to admit defeat, we followed the country road for a little over a mile until we were obliged to leave it and set off across the open fields of the mountains. It was in one such open field at the edge of the sea that we stumbled across the tower and, as I said before, it was here that we paused to eat our lunches in the lashing rain. DUMBASS LITERATURE STUDENT DIES WHILE EATING CARROT. WHAT THE HELL WAS HE DOING OUT THERE ANYHOW? As Ian wandered around the tower, my thoughts grappled with the improbability of the structure itself. Who had built the tower in such a remote place, such a wild frontier that remained lonely and cold and untamable in our modern age of technological boredom? I could see them now: the ghosts of the past, ripping the tower’s foundations out of the frostbitten soil, erecting a skeleton of scaffolding in the spite of the wind and the snow and the rain. They had come to the edges of the earth to be alone, to escape the overwhelming meaninglessness of the society they had come from. The storm worsened, and so we were finally obliged to go back way we came, jogging along the soggy heather until we reached the village in the valley. It was a small place: two pubs, a school, a church, and a shop. An old man shuffled along the otherwise deserted streets. He waved to us with his walking stick as we hurried into the shop to buy bacon, beer, butter, and bread. We returned to our cottage with our groceries, changed into dry clothes, built a peat fire, and slapped a proper fry onto the stovetop. The smell of bacon and coffee and burnt bread drifted up into the cottage’s wooden rafters. I pulled on a thick sweater and walked out onto the porch while the food cooked. The rain was still falling, and in the fields around me sheep were scurrying for shelter, clumping into fluffy knots in an effort to escape the deluge. It was only four o’clock, but the sun was already beginning to set below the mountains. After only a few hours of daylight, we would again be lost in the depths, drifting through darkness in our fragile submersible of light. In that moment, I understood that I too was building my tower on the edge of the sea. One morning back home, I had awoken in a howling loneliness and, in a panic, I fled. I scurried away like a scared sheep, bleating as I raced over the United States and the Atlantic Ocean, scrambling and stumbling and skinning my knees in the midst of my own unexplainable terror. And so there I was, far away from home, building the walls of my fortress ever higher so that I would not have to face the quiet and the cold.